An original letter of correspondence between brothers and business partners Joshua Coffin Chase and Sydney Octavius Chase. Topics discussed in the letter include the handling of Isleworth pineapple oranges at Isleworth Grove, C. E. Browne's inefficiency in cleaning mid-season oranges, the Selling Department's practice of furnishing the Isleworth brand only and leaving the Coat of Arms brand as second-grade, the current operating program for tangerines, the absence of Mr. Pratt, and the Fruitman's Club's success in holding back shipments. Original letter from Joshua Coffin Chase to Sydney Octavius Chase, January 29, 1927: box 49, folder 20.84, Chase Collection (MS 14), Special and Area Studies Collections, George A. Smathers Libraries, University of Florida, Gainesville, Florida. 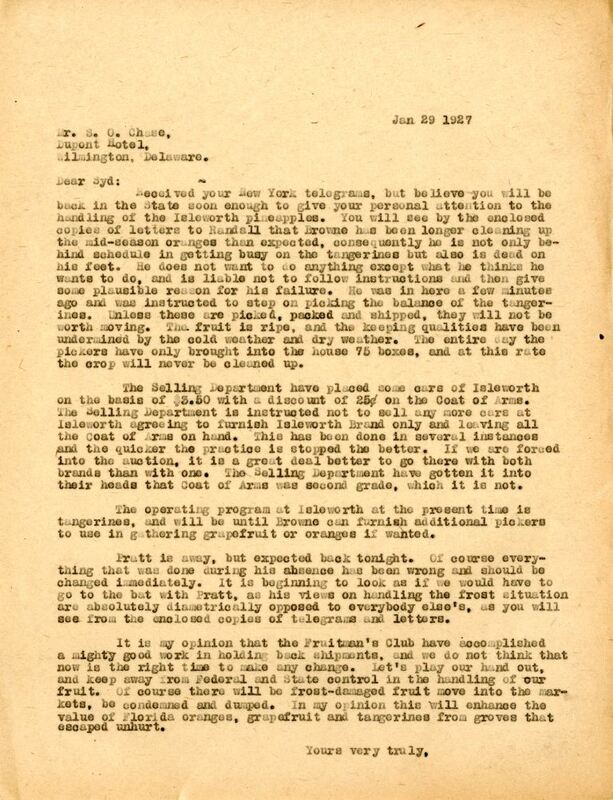 Digital reproduction of original letter from Joshua Coffin Chase to Sydney Octavius Chase, January 29, 1927. Received your New York telegram, but believe you will be back in the State soon enough to give your personal attention to the handling of the Isleworth pineapples. You will see by the enclosed copies of letters to Randall that Browne has been longer cleaning up the mid-season oranges than expected, consequently he is not only behind schedule in getting busy on the tangerines but also is dead on his feet. He does not want to do anything except what he thinks he wants to do, and is liable not to follow instructions and then give some plausible reason for his failure. He was in here a few minutes ago and was instructed to step on picking the balance of the tangerines. Unless there are picked, packed and shipped, they will not be worth moving .The fruit is ripe, and the keeping quantities have been undermined by the cold weather and dry weather. The entire day the pickers have only brought into the house 75 boxes, and at this rate the crop will never be cleaned up. The Selling Department have placed some cars of Isleworth on the basis of $3.50 with a discount of 25¢ on the Coat of Arms. The Selling Department is instructed not to sell any more cars at Isleworth agreeing to furnish Isleworth Brand only and leaving all the Coat of Arms on hand. This has been done in several instances and the quicker the practice is stopped the better. If we are forced in the auction, it is a great deal better to go there with both brands than with one. The Selling Department have gotten it into their heads that Coat of Arms was second grade, which it is not. The operating program at Isleworth at the present time is tangerines, and will be until Browne can furnish additional pickers to use in gathering grapefruit or oranges if wanted. Pratt is away, but exposed back tonight. Of course everything that was done during his absence has been wrong and should be changed immediately. It is beginning to look as if we would have to go to the bat with Pratt, as his views on handling the frost situation are absolutely diametrically opposed to everybody else's, as you will see from the enclosed copies of telegrams and letters. It is my opinion that the Fruitman's Club have accomplished a mighty good work in holding back shipments, and we do not think that now is the right time to make any change. Let's play our hand out, and keep away from Federal and State control in the handling of our fruit. Of course there will be frost-damaged fruit move into the markers, be condemned and dumped. In my opinion this will enhance the value of Florida oranges, grapefruit and tangerines from groves that escaped unhurt. Chase, Joshua Coffin. 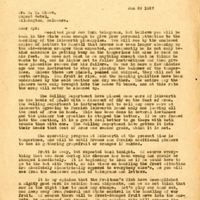 “Letter from Joshua Coffin Chase to Sydney Octavius Chase (January 29, 1927).” RICHES of Central Florida accessed April 21, 2019, https://richesmi.cah.ucf.edu/omeka/items/show/2721.